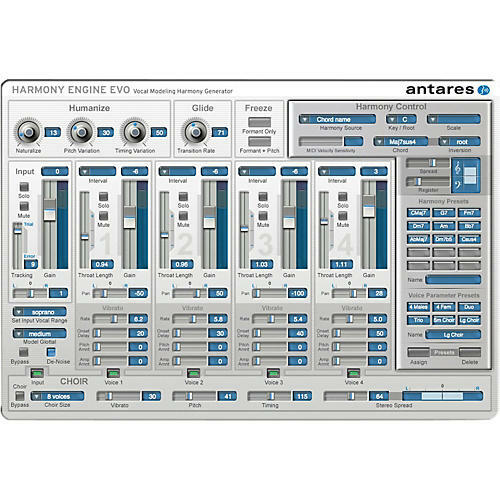 From the company that helped revolutionize professional vocal production with Auto-Tune pitch correction technology, comes Harmony Engine Evo, the second generation of Antares' real-time harmony generating plug-in that puts professional-quality vocal harmony arrangements within reach of any songwriter, producer, musician or engineer. Building on the power and ease of use of the original Harmony Engine, Harmony Engine Evo incorporates Antares' groundbreaking Evo Voice Processing Technology for faster, more accurate pitch detection, smoother, artifact-free pitch shifting, and seamless, natural-sounding (if you want it to be) throat modeling. And with the addition of 5 channels of Antares' unique CHOIR Vocal Multiplier, you can now create huge vocal ensembles out of a single vocal line. Whether you're an experienced vocal arranger, a songwriter looking for that perfect backup vocal, or a composer experimenting with unique vocal effects, Harmony Engine Evo gives you entirely new ways to create the harmony parts you hear in your head. In fact, experimenting with different harmonies is so easy (and, dare we suggest, fun), you may find yourself using Harmony Engine Evo to explore harmonic alternatives you may have never otherwise considered. Voice Parameter Preset matrix that lets you create and instantly recall up to 6 different "vocal groups"
One year parts and labor warranty for hardware. Replacement warranty on defective discs.